Harvest Noon Cafe provides a relaxed and inclusive gathering space for both U of T students and members of the wider community to eat, cook, learn about, and express their love for food. As a cafe we aim to serve local, sustainable, and organically produced food and to support principles of food justice and accessibility. 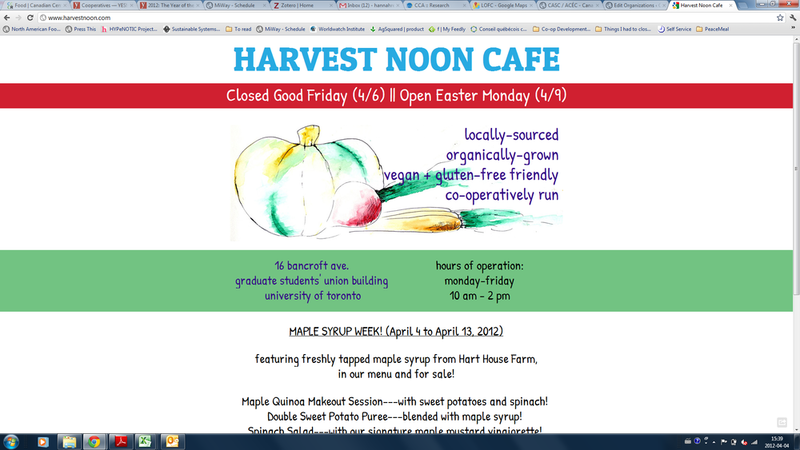 Harvest Noon is a project of the Toronto Sustainable Food Co-operative, an organization initiated by members of the student group Hot Yam! in the Fall of 2011. By building relationships with local producers and like-minded groups, we provide opportunities and support for folks interested in fostering good, clean and fair food alternatives. Newer PostYour Local Market Co-operative Inc.